This is your chance to see what Colorado Springs has to offer! Some of our community partners joining us for Collegefest are: Starbucks, Chick-fil-A, Rocketfizz, Which Which, and many other folks will be joining us showcasing what they have to offer to our students. There will be prizes, food, and activities there - you won't want to miss it! 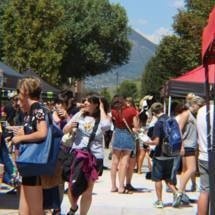 UCCS is committed to an inclusive environment and welcomes participants with disabilities. Please contact our office at 719-255-3470 or studlife@uccs.edu to discuss reasonable accommodations allowing for all to participate fully.